The Red Bulls managed to repulse wave, after wave, after wave of determined Houston Dynamo attacks and came away with their third 1-Nil victory in a row this past Wednesday night. This one wasn't a classic by any means, and only noteworthy for the Alamo-like stand our still shorthanded team made to preserve the 1-0. In fact, it's probably best quickly forgotten, but three points is three points - thank you very much! To say that the Dynamo should have gotten something out of this one would be a massive understatement. While we definitely saw another solid performance from rookie goalkeeper Ryan Meara, this newbie Red Bulls backline was beaten several times but (thankfully) not made to pay. Former MetroStars midfielder Brad Davis alone should have had 3 goals in this one. The Red Bulls continue to ride their luck without Thierry Henry. Kenny F'ng Cooper delivered, yet again, notching his 8th of the season. DJ Jan Gunnar Solli returned to the starting line-up, but at Left Midfield as Brandon Barklage kept his place at starting Right Back. Roy Miller returned to action as well, but only as a late sub (for Solli). With rookie Connor Lade putting in another solid performance at left back, Red Bulls fans can only wonder if Miller's starting LB days are over. Another performance of note was that of RBNY's own Ginger Prince, Dax McCarty. 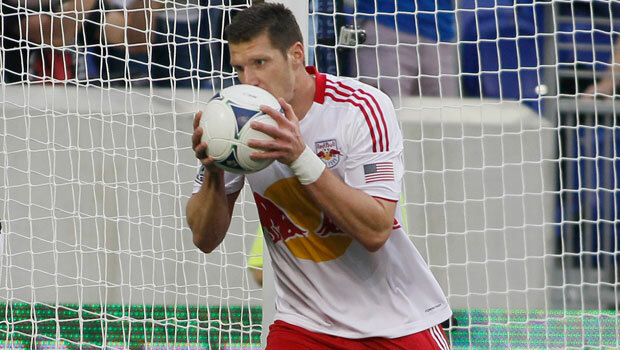 McCarty, who kept his place due to Rafa Marquez picking up an ankle injury in training, was instrumental in keeping lots of pressure off the patchwork Red Bulls backline. A few more outings like this one and RBNY fans will not even remember the name of the player we traded for McCarty. I got there 10 minutes into the game and missed Cooper's goal. Now, I'm not one to complain much, but it would be nice if mid-week games started at 8pm or, at the very least, 7:30pm. Those of us who have to work regular hours, and have to drive through rush hour traffic, would appreciate that very much. Announced attendance was 11,315, to which I say: Yeah, Right! I would be surprised if the place was actually 1/3 full, but whatever. Next up: @Philly on Sunday. Let's stick it to em, boys! Please see the above vide for Part I of our usual drunken comments/predictions. You can click here for Part II and click here for Part III. Please click here for my photo album of this one (slide show here). You can also click here for the set from the Official site. Viper Out!